A blend of pure waterproofing asphaltum and high grade aluminum pigments . This material will reflect up to 80% of the sun’s rays, helping prevent excessive drying and cracking of substrate, thus reducing leaks. Areas immediately under roof will remain approximately 15-20 degrees cooler in summer. In winter, inside heat is reflected back into the building, thus saving energy costs. Dries Silver. 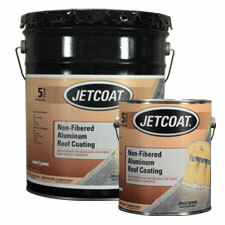 Repair all cracks, splits, and holes using JETCOAT All-Weather Roof Cement and Resin Treated Multi-Purpose Reinforcing Fabric, adhering to the directions on their label. Allow repairs to weather at least 30 days before coating. Clean surfaces thoroughly by brooming away dirt, dust and loose particulate. Remove all grease and oil using detergent and water, rinsing thoroughly. Broom away excess water and allow to dry completely. Mix coating thoroughly before and during application. Uniformly coat the entire surface with the coating using a roofing brush or roller. Do not apply if rain or heavy dew is expected within 24 hours of application. Do not apply to wet or damp surfaces. Do not apply if temperature is expected to fall below 50°F. within 12 hours of application. Clean up with waterless hand cleaner immediately after use. Do not apply to roofs which hold water. Standing water will result in premature failure. Areas immediately under roof will remain approximately 15-20 degrees cooler. 65735 4.75 gal. Pail 47 lbs. 65731 .9 gal. Can 9 lbs.